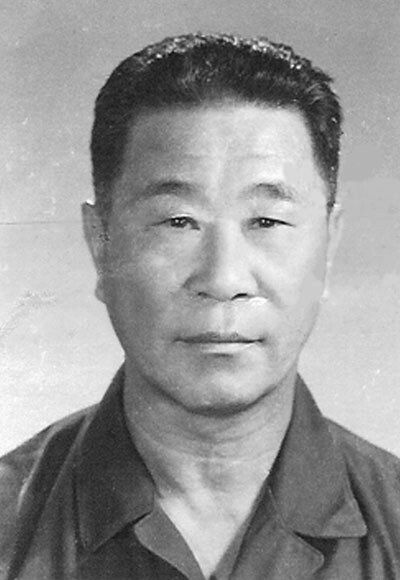 Chan Tai San (Chan Tai-San; Chinese: 陳泰山) (July 12, 1920 – September 1, 2004) was a Chinese Martial Art Grand Master Often called one of China’s ‘living treasures. Chan said he began training at age eight under Yee Hoi-Long, a stonemason who worked for the Chan family. 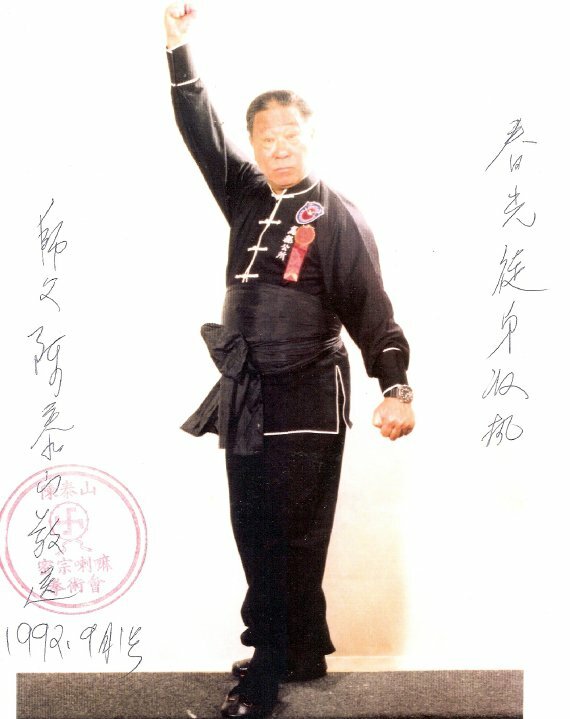 Yee taught ‘Hung Fist’, also called ‘Hung Kuen’ or ‘village style,’ a forerunner to Hung gar, and ‘Hung Tao Choy Mei’ (which means ‘Hung Head Choy Tail’), later known as Jow Gar, a system combining strong Hung style fist work with active Choy-style footwork. Chan learned from Yee for about six years. 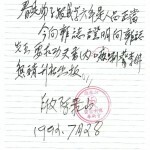 Chan was 13 when, after the death of his father, he was sent by his family to the Clear Cloud Temple where he began training in Kung fu and Buddhism and was mostly a student of Jyu Jik Chuyhn (朱亦傳). Chan was also taught by the monk Gaai Si Wu Song. 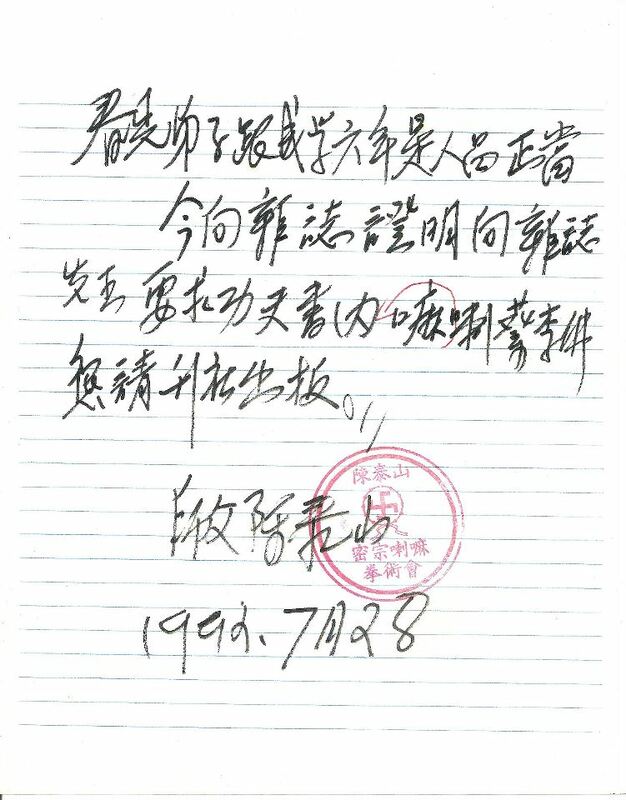 At 17 Chan Tai San left the monastery to fight against the Imperial Japanese Army, enlisting in a peasant division which also had some of the most skilled traditional martial arts fighters in China. While in the army Chan Tai San trained and served with Cheung Lai-Chung (White Eyebrow or Pak Mei style), Pak Mo Jyu (nicknamed the “White Haired Devil,” Hung Fut style) and others. 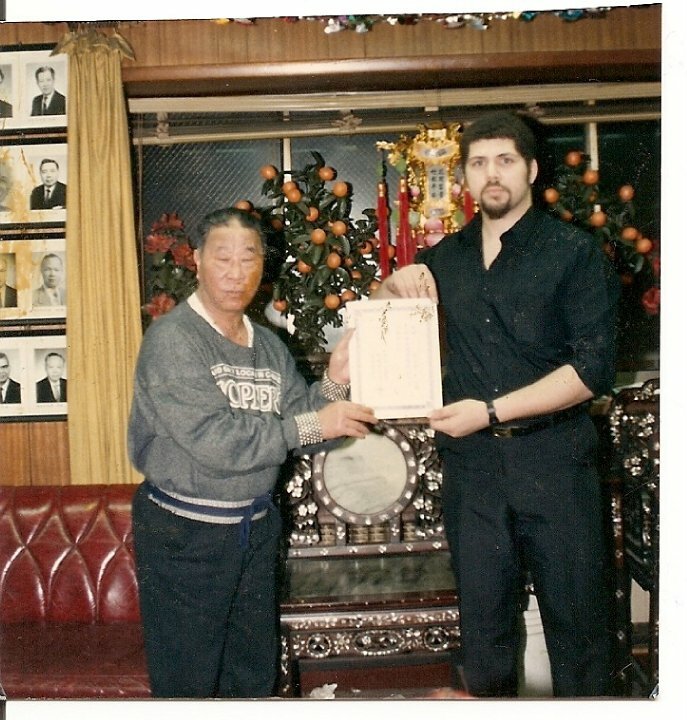 After the war Chan traveled throughout China meeting and training with more sifu such as Mok Jing-Kiu (head of the Mok family style) and Chan Sai-Mo (Choy Lay Fut style). Whilst in his 40s Chan went back to the Clear Cloud Temple and learned Lama Pai (喇嘛派) from Jyu Jik Chuyhn. 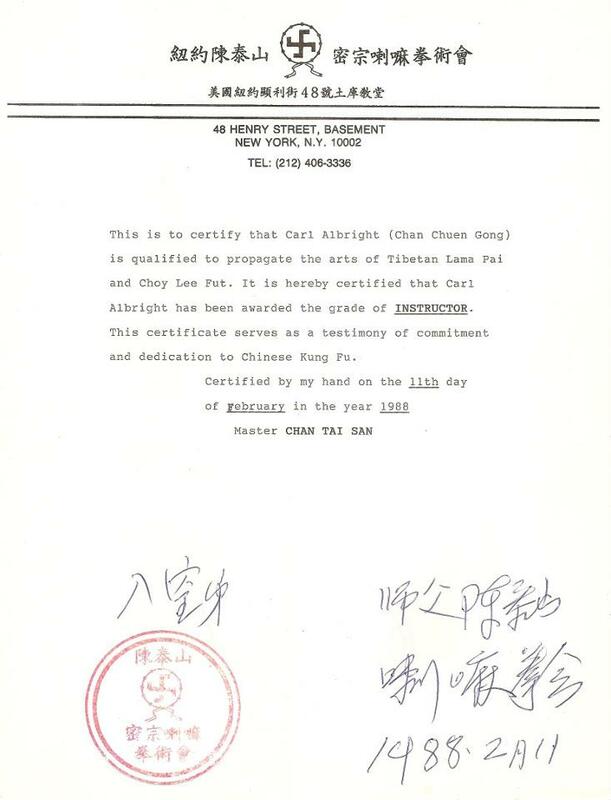 Chan trained and promoted Chinese martial arts in China and abroad. 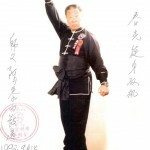 He was coach of the Guangdong Province martial arts demonstration team from 1980 to 1982, a hand to hand fighting (Sanshou) instructor for an elite Fut San military unit, and a member of the executive committee of the Toi San region martial arts association. 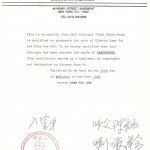 As a member of the national demonstration team (and through exhibitions at national level tournaments in the United States), Chan demonstrated internal martial arts (Qigong), iron palm, and iron body. 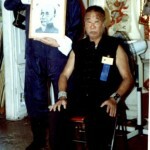 Chan Tai San was one of only a few instructors who openly taught the Lama Pai style. When he opened his classes to Americans there were estimated to be only five other public Lama Pai sifu in the world. Sifu Carl studied under Grand Master Chan for 20 years in the arts of Tibetan Lama Pai and Choy Lee Fut. Grandmaster Chan (R.I.P.) 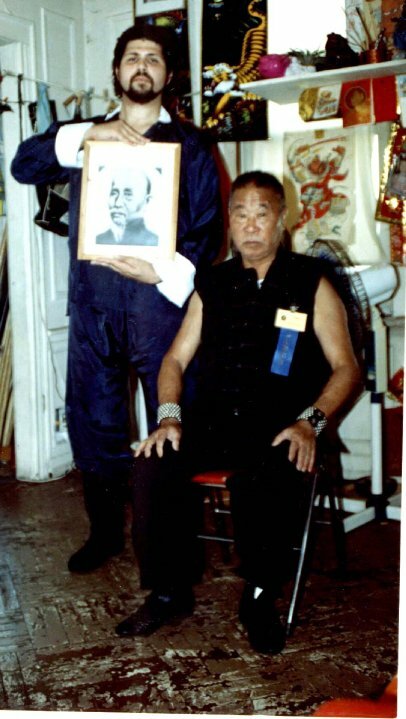 was a legend in the world of Kung-Fu and will always be considered a “Treasure of the Chinese Nation.” He trained in the arts his entire life and taught thousands of students his Kung-Fu styles Lama Pai & Choy Lee Fut.